After getting hold of suitable scale drawings I have started on my 3D printed design for Oerlikon EMU 3 car unit. Although I never saw them in operation, just too young, they were used on 2 of the lines near where I was born in Croxley Green. They were used on both the Croxley Green line and the Rickmansworth Church St lines, and I felt I would like a model. For my own use I plan to have them in HO, although I might be tempted by other bigger scales. Still a bit of work, including chassis frame. The other units are virtually same size, just with different doors and windows. the complex bit was getting curves of end profile looking right. I had some photos of 7mm scale drawings with measurements which helped. I have book on Southern Railway EMU stock, going back to LBSCR and LSWR days so might be tempted by those next. The modified ex overhead powered ones appeal. There is also the Metropolitan stock to look at, as I have the books on those. Interesting. How hard would it be to convert the printing process to 1:48 scale? 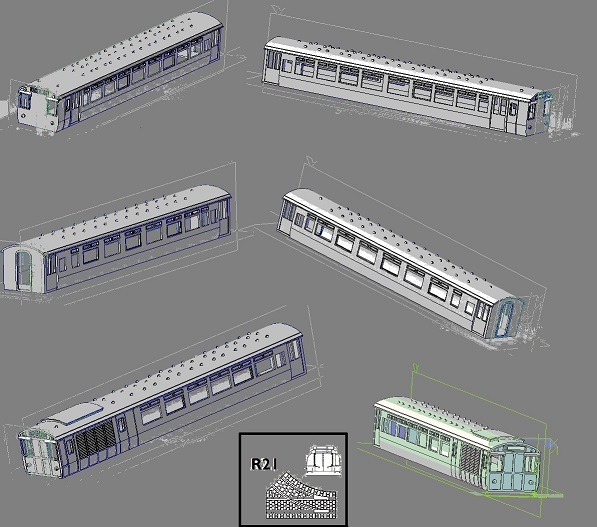 The car in your drawing would make a neat looking diesel railmotor for the FCPyF. As Oerlikon are an industrial manufacturer rather than a railway company who's to say they didn't use a similar design on a narrow gauge DMU for export to South America? I remember them running between Richmond and Broad Street - at least I presume that was the route; I never had the opportunity to use that line until some years later. Did Oerlikon make the whole unit, or was it only the electrical gear - although the name got given to the train as a whole? Don't know, but I'm sure someone will! Oerlikon supplied the motors. Siemens supplied the motors for original batch, which were fully panelled. There were a few other differences in design as well, and the first batch ultimately ended up being converted to overhead supply to run on Heysham line I believe. Giles , you are right about them running on Richmond line, I assume to Broad St, as that is on front of some units in photos. In theory that could lend itself to a fictional station with both Oerlikon and Southern EMUs . I got copies of drawings for motor coach and middle coach from HMRS, but they could not find one for non motor driving unit, so they contacted someone who had had similar problems and he had got drawings from Birmingham library(the same resourcce you have used in the past Giles), and sent me some photos.Although not to scale(camera photo), they had measurements on them for 7mm/ft, so I was able to workout everything. In fact they were better than the original ones, as these were for the subsequent batch with flush sides. I would still like to track down the missing one for first batch, just for completeness. Resizing these designs is no problem. In fact original is done to 1/43 as measurements are for that. I prefer to design big, as it helps eliminate some minor errors in measurement, when reducing, if any. Only thing is that the price goes up a lot for bigger prints. There were a series of three fold out plans for '0' gauge with the Model Railway Constructor Jan - Mar 1939. I will try to get them scanned over the next week and email you a copy. Looking back to the first post in this thread brought back another memory, this one of ex-LSWR EMUs still running at the end of the 1950s and possibly just into the 1960s. I used to commute to school from Strawberry Hill and used to look out for the stock that had quite a pointy nose to the front of the driving cab. These must have been built as 3-car sets as they had a non-matching trailer car which may originally been a 1st class coach. At all events the compartments were wider (not knee-lockers as some others were) and the seats were much better upholstered - one could lean back and really sink into the upholstery. This was still in the days of letter route-codes; The Teddington circle was V in one direction and V with a bar above for the other. I think trains terminating at Strawberry Hill, where there was a carriage depot, used the V upside down. Other services, to Shepperton, used an S. Trains terminating at Kingston (via Richmond) had an upside down P, actually looking like a d.
Earlier when I was much younger we lived in Windsor, and the SR trains I think carried the code H. I don't remember an I code, but the trains were fabled to spell HOVIS when waiting at Waterloo. By the time we'd moved, the Windsor trains were 18 (via Twickenham) or 58 (via Hounslow). Reading services carried the code 28. O was the code for the Hounslow loop, again I suspect with a bar above to differentiate between clockwise and anti-clockwise trains. Clive, I wonder if those are the ones I have , as it did seem strange that they had been done to 7mm scale. Please scan them if you can. Giles, I have the book of SR EMU drawings by Brian Golding. Plenty to keep me happy for a while. The LWSR units would make a nice model. Some originated as steam hauled stock. I wonder if they could be converted from Hornby coaches, but it would be a brave person to cut up expensive models. Looking through the book, and I think the LSWR were rebuilt again on longer frames. It is the ex LBSCR ones converted from overhead stock, with flattened roof one end, which interest me more. Justifying mixture of trains might be tricky. Quite a challenge, but if (big IF!) the connection between the Broad Street line and the East London line at Shoreditch was as it is now you might have seen Oerlikons at New Cross or New Cross Gate - or even potentially further south, and so well into Brighton electrified territory. Given some of the north-south inter-company connections that existed up to about 1917 this may not be as far fetched as it might seem. On a similar note - but a good few years later - I was really surprised to see a Jinty on a goods (coal?) train at Borough Market Junction in the early 1960s. It must have come from the ex Midland main line, probably Brent Sidings, via the Widened Lines and Blackfriars and was going to one of the Midland's old coal depots south of the river. Maybe extra lines to west of London, LNWR/NLR going further than Richmond. That area is abit congested, so more lines to north, avoiding Watford. The area around what is now Heathrow could fit in some more railways. I had originally being planning a small layout based in that area, with both London Underground and Southern Region trains(This idea evolved into my Dunsfold plan), but the Heathrow/Uxbridge plan could easily become a station with mix of ex LNWR, Southerm and possibly London Transport. one coach is on its way from Shapeways, other 2 are being printed. Now I am planning to use these on a 1950s/60s layout, but I am also thinking of possibly having some on a 1940s layout, but put off by fancy lined out LMS livery. Just wondering if livery was still lined during the war or was it simlified like te locos. Some of these units had modifications done, principally removing 1st class from centre coach, so were they also repainted. I am also looking at going other way and thinking that some units just lasted into BR blue era and were repainted in blue. The Altringham GEC compartment stock lasted and these were similar in some ways, and not much younger. First coach arrived today, a day early! Helps having weekend inbetween. Some might not like gainy feel to plastic, but it can be sanded down, one reason I did not add ibts like door handles and handrails. all 3 coaches now received. given them a slight rub down, then painted with acryllic and emulsion paints. 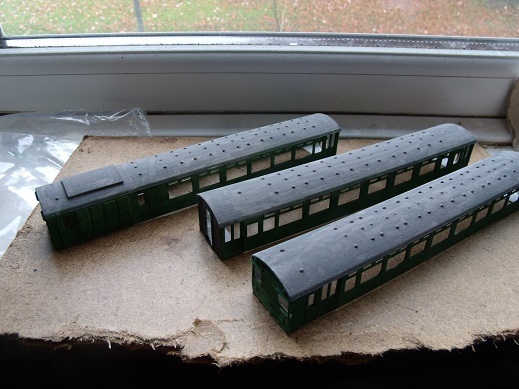 I have some Playcraft/Jouef coaches, plan to use the bogies, which are close enough. Need to work on chassis and interior(well certainly glazing initially). Probably use a Tenshodo SPUD for power. As I am happy with 3D prints, I will make them available, along with a 1/76 scale version. Photos often cruelly show roughness of 3D printinting, but I don't think they are that bad. Better than anything I could scratchbuild. OO gauge version now available. 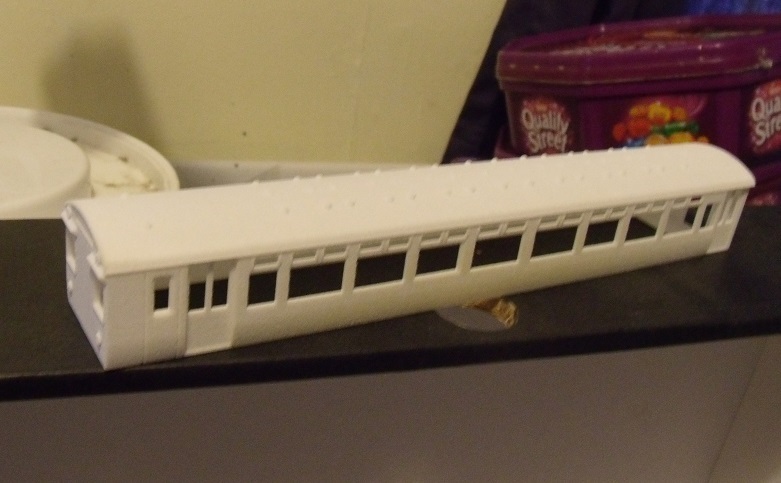 Suggest using Dapol(ex Airfix) coach chassis as a basis. The old Hornby shorter mainline coach might also be OK, but the Dapol ones are in kit form and you could find a another use for the coach bodies.